The American Dream mega-mall and entertainment complex, located just outside Manhattan in New Jersey, is making significant progress on the new Nickelodeon Universe theme park. 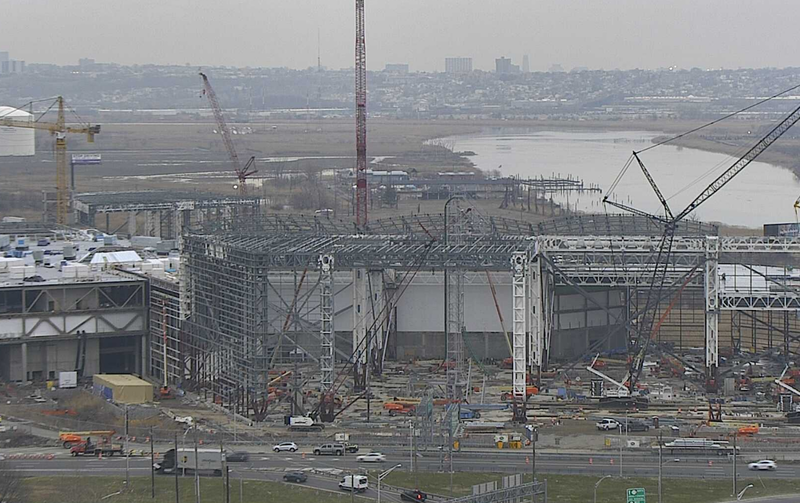 For those who want to stay up to date with the action, Earthcam has a live view of the building progress that you can watch all day if you like. Above is a shot from the camera, which includes a large panoramic view but also allows you to focus in on the theme park area. 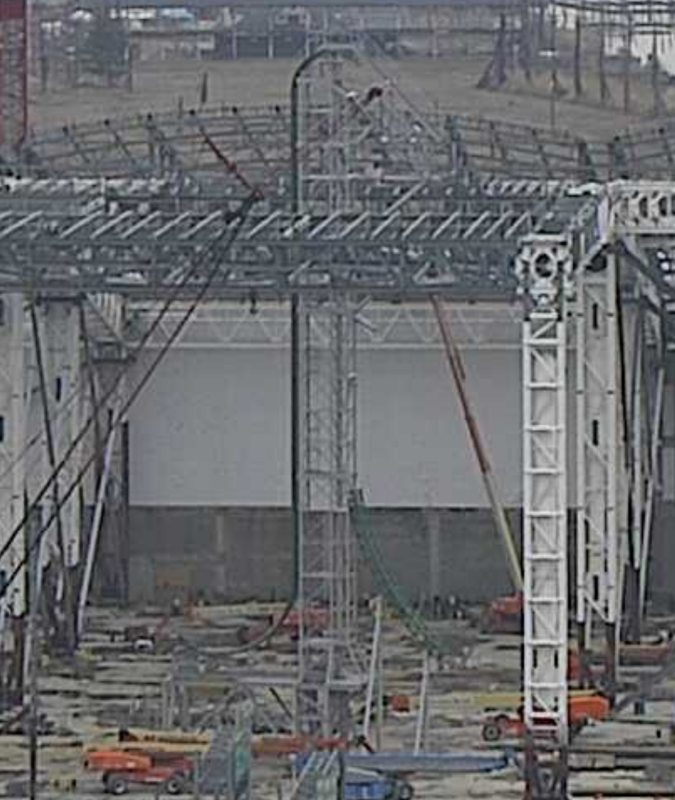 The massive structure being created to house the indoor theme park is going up, and due to the size of the park's largest roller coaster that means it is also being built. Can you spot it on the image above? If not, here is a zoomed in view. The park's near-clone of Takabisha, a 141 foot tall Gerstlauer Euro-Fighter coaster is standing tall. 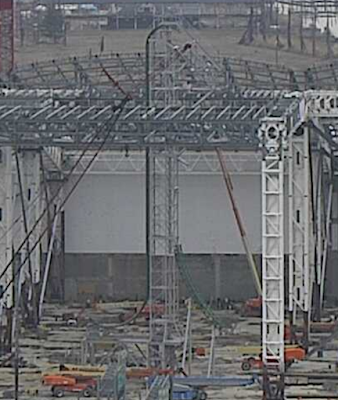 The ride is taller than the main roof of the park, so it needs to go up before the roof can be totally finished. The lighting in this photo isn't that great - it's a gloomy day in the area - but you can see the main lift and drop support with track running up the vertical lift and over the crest of the hill. Very hard to see, but the supports for the start of the drop, before it curves down to a 121.5 degree drop, are installed. Just this afternoon the crews also installed green track at the base of the lift hill, which is easier to see here. The ride will feature both the way-beyond vertical drop as well as a launched section mid-ride. There will be many inversions during the ride, and this will be one of the largest Euro-Fighters around. Another coaster, a large custom Gerstlauer spinning coaster, will weave its way through the Euro-Fighter as well. I can't see any progress on that ride at this time. The American Dream project has a long history and there have been many doubts that it would ever open - so actually seeing a coaster going up is some really great news!